Detail of the vimana or great tower of the Brihadishvara Temple, Tanjore. bl.uk > Online Gallery Home	> Online exhibitions	> Asia, Pacific and Africa Collections	> Detail of the vimana or great tower of the Brihadishvara Temple, Tanjore. 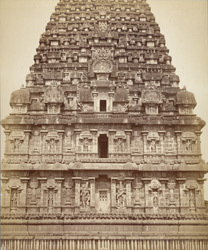 Photograph of the tower or vimana of the Brihadishvara Temple, Tanjore, from theAlbum of Miscellaneous views in India,1860s. The Brihadishvara Temple built by the Chola king Rajaraja around 1010, is a monumental temple standing in the middle of a large courtyard surrounded by smaller shrines. To the east, a monolithic Nandi is sheltered in a 16th century pavilion. On the north-west of the main shrine, there is a temple dedicated to Subrahmanya dating to the 17th century. The temple is entered through the east by two gateways. The tall pyramidal tower over the sanctuary reaches 70 metres and consists of diminishing storeys culminating in the octagonal domed roof and the golden pot finial. It is covered with miniature edifices and figure sculptures that symbolise the cosmic manifestation. This view shows the sculpture on the lower storeys of the vimana of the Brihadishvara Temple.